Who doesn't want to see another performance of WSPA's Hakuna Matata? On January 12th and 13th, the Musical Theatre Company performed to a full house at Skyline College Theater. The lobby was decorated in a jungle-theme, and the main cast members were there to greet their guests before the show. As a special treat for the children on Sunday, Rafiki came out to tell the children the story of Simba. Once again, MTC presented two fun-filled performances. Ms, Katie Kerwin did a fantastic job with the cast. Camille Edralin brought Rafiki to life on stage. Her powerful voice captured you from the start of the show. You could feel the presence of Mufasa with Jan Jerome Ochoa's voice. Zazu seemed to be chittering around and you almost forgot Amanda Nguyen, the actor, was up there. Who didn't feel a lump in their throat when Nala, played by Katie Edralin, sang ShadowLand and received a blessing from Rafiki? Scar was sinister! Andrew Gonzalez, with his band of hyenas including Alysia Beltran, Kylie Abucay, and Lauren Cabeza brought menace onstage. Kai Santiago, who played Simba, rendered a beautiful "Endless Night." Hakuna Matata was sang by the entire cast featuring Pumbaa (Rodney Martinez), Timon (Tanya Rose Santos) and Young Simba (Jonacy Montero). That song was in my head for days! Watching the individual expressions and reactions to Pumbaa made each show unique. Rodney and Tanya were successful in portraying the comedic relationship between Pumbaa and Timon. The cast, as well as the audience, really seemed to enjoy that number. Young Nala (Laurie Tang) and Young Simba (Jonacy Montero) were adorable, along with the little African Animals (MTC Petites). If you watched a different Petite, you would see a different show each time. Most memorable in the show were the beautiful songs and the make-up! From the MTC PreProfessionals and Seniors, to the Juniors and Petites. A lot of research was obviously done by the cast members as their faces came to life as African Animals in the Mighty Jungle! 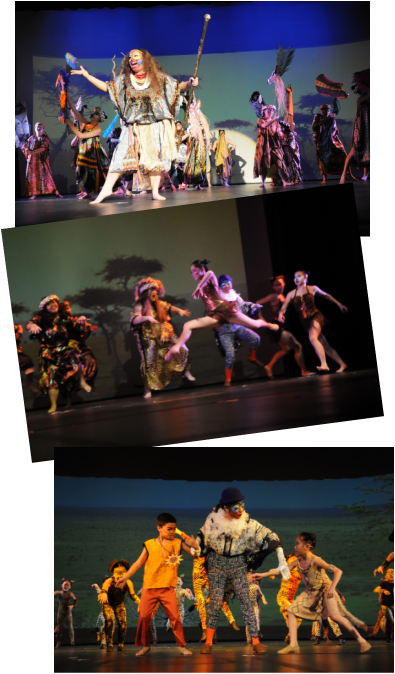 A special mention also for the totem creations by the African Chorus (PrePros and Seniors), and the Ballet Apprentice dancers who performed Grasslands Chant. We would like to thank Ms. Katie and MTC for the wonderful show, and look forward to watching their next production in the summer.